A study of epithermal Au and Ag mineralised quartz from this area on the North Island of NZ was undertaken with Penelope Small and Prof. Andrew Rankin of Kingston University, Surrey and the cooperation of Newmont. Ten samples were collected from drill core in an attempt to determine spatial temperature and fluid composition variations with depth and horizontal position within the vein. The samples show low decrepitation intensities, as expected for dominantly vapour filled, high level epithermal fluid inclusions in quartz. However it is still possible to discern important differences between the samples which seem to correlate with Au mineralisation. In particular, there is evidence for the presence of CO2 rich fluids correlated with the best mineralised samples. 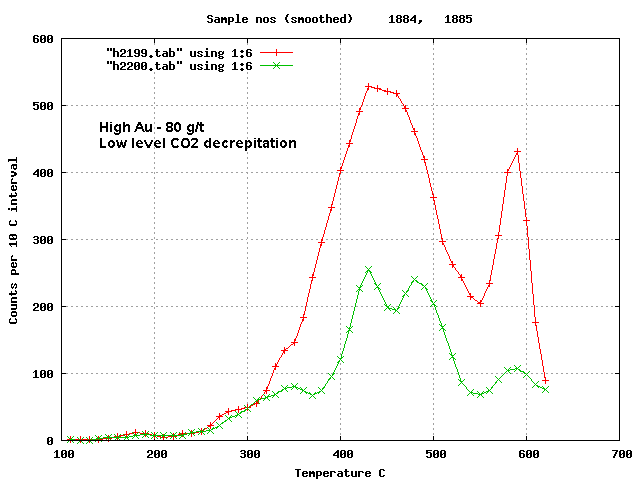 Despite the low decrepitation intensities, this data clearly shows a strong correlation between known gold grades and the presence of low temperature gas-rich decrepitation. 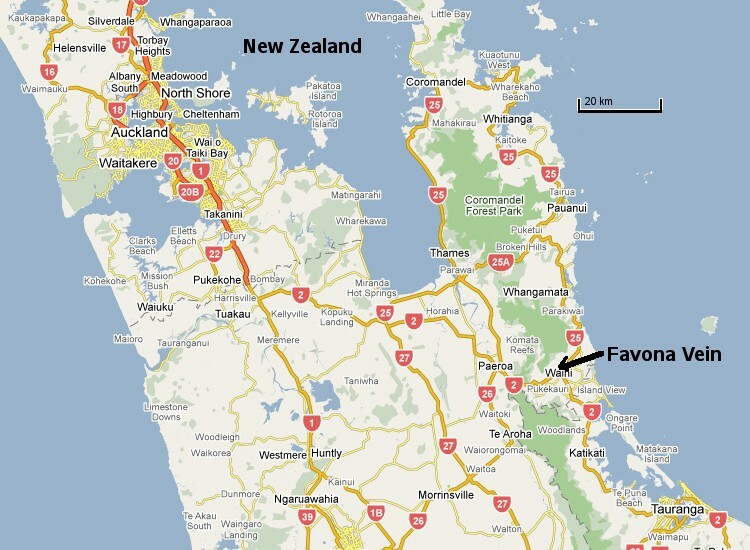 Additional discussion of the Favona results is here. 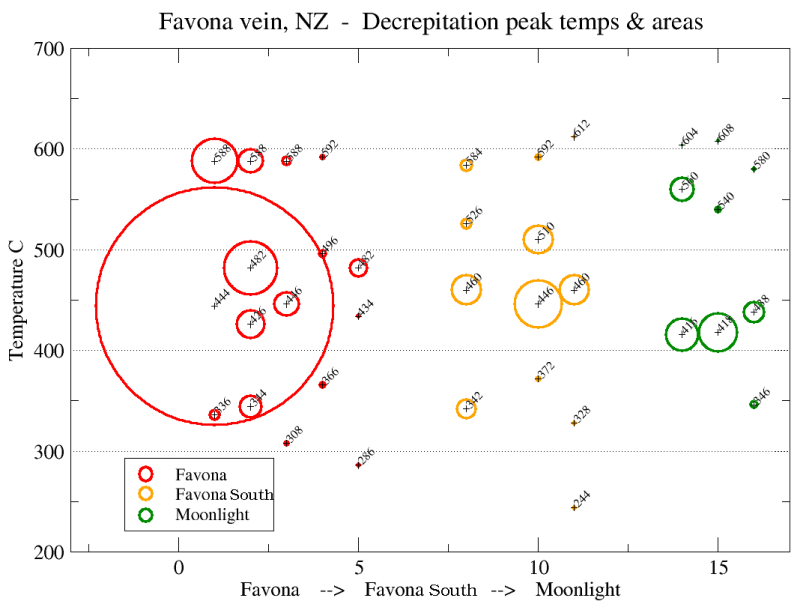 There are also variations of the decrepitation temperatures of the main peak near 400 C which suggest the technique is capable of mapping out thermal gradients within the quartz system, and these variations are likely to also correlate with mineralisation potential. Incomplete sample location information and sparse sampling limit the complete interpretation of this data at present. These initial plots have been grouped based on the Au contents of the samples. The above samples with high Au contents, about 80 g/t, show distinct decrepitation at low temperature near 300 - 350 C which is typical of samples which contain CO2 rich fluid inclusions. These samples are from an unspecified location, thought to be UW67 (not UW167) at about 950m RL in the Favona vein. Samples with moderate Au contents, about 40 g/t, lack this low temperature decrepitation. These samples also have very low intensity of decrepitation which is typical of high level epithermal inclusions, which are often vapour rich and do not decrepitate well. These samples are also from about 950m RL in the Favona vein. 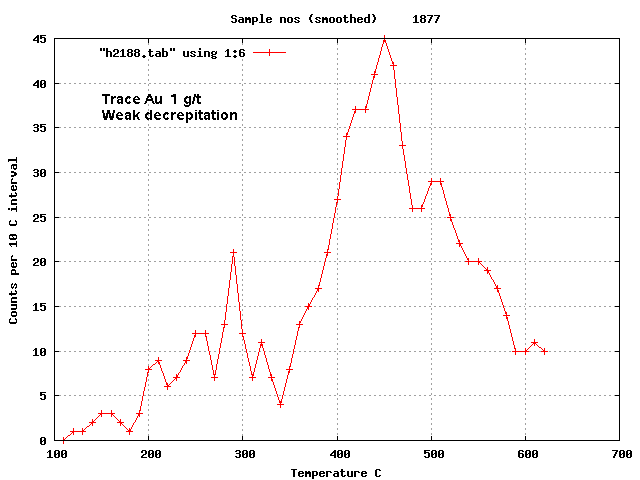 This sample, with 40 g/t Au shows only background decrepitation. This is interpreted to be a vapour rich area of the vein system. This sample is also from about 950m RL in the Favona vein. This sample with only low level Au of about 1 g/t shows weak, but distinct decrepitation and perhaps a hint of CO2 rich inclusions. This sample is located close to the main ore zone and the fluid inclusions indicate that good mineralisation is nearby despite the low chemical analysis result. It is from about 900m RL in the Favona vein. These samples have < 0.1 g/t Au and are distant from the active workings. 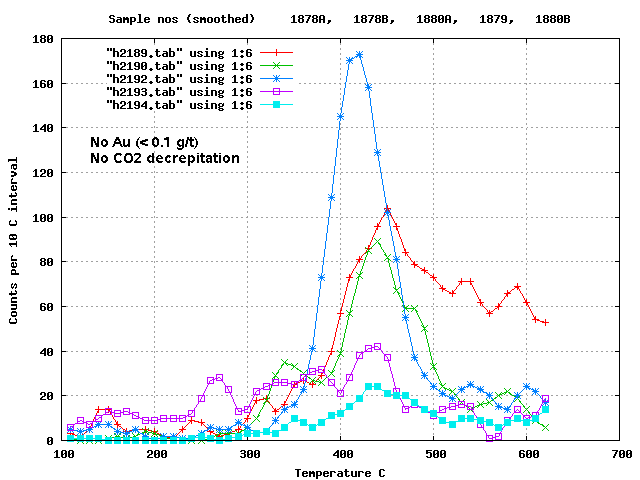 The decrepitation results show a lack of CO2 and suggest low mineralisation potential. Note that there are significant differences in the temperature of the main peak and with sufficient sample coverage these variations might be mapped to show thermal gradients within the quartz vein system. Samples 1878 and 1880 are from the Moonlight area, while sample 1879 is from Deep in the Favona vein, about 700m RL. These samples have only <0.2 g/t Au and lack low temperature decrepitation and CO2. The more intense decrepitation and better shaped peaks suggest this quartz contains more liquid rich inclusions, probably formed at greater depth and pressure than other samples in this study, despite being collected shallower than other samples. The green plot is the same sample as the red, done at higher instrumental sensitivity. The blue, magenta and green plots are 3 splits of the same sample to check for homogeneity. This sample is from the Favona South shoot at about 1000m RL. 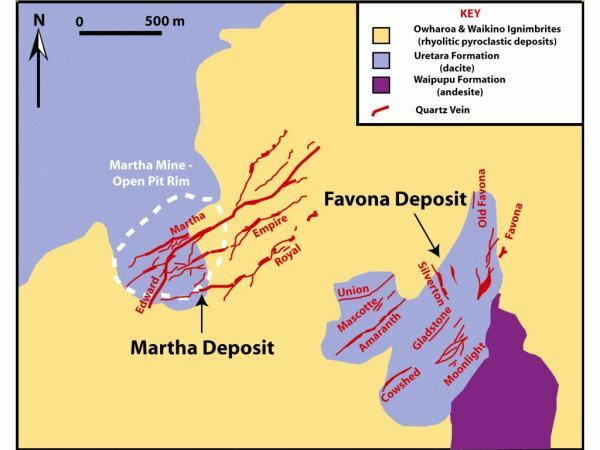 The locations within the mine are shown on this N-S pseudo section. Samples 1884 and 1885 were wrongly described by the student and are shown here at their probable location. The thick grey lines are the mine workings and entrance adit. The sample locations and gold analyses are in this table. 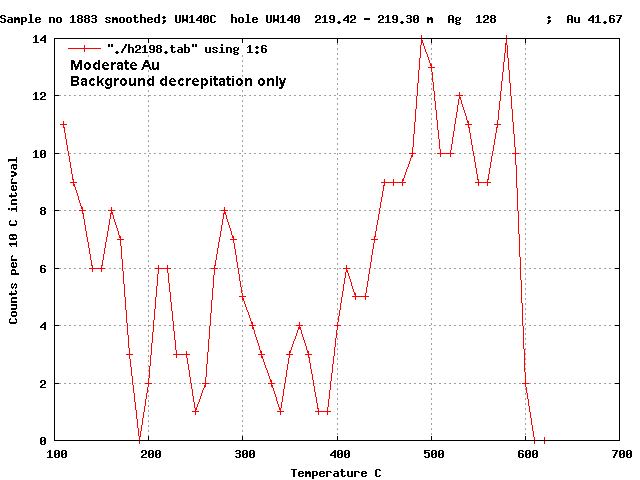 De-convolution of each decrepigram was carried out to determine the individual component skewed-gaussian populations present in each sample and this data is plotted below, where the circle diameter at each temperature is proportional to the decrepitation intensity of that component population. The better mineralised Favona main shoot (red) has more intense decrepitation and small but measurable low temperature, gas-rich inclusion decrepitation. 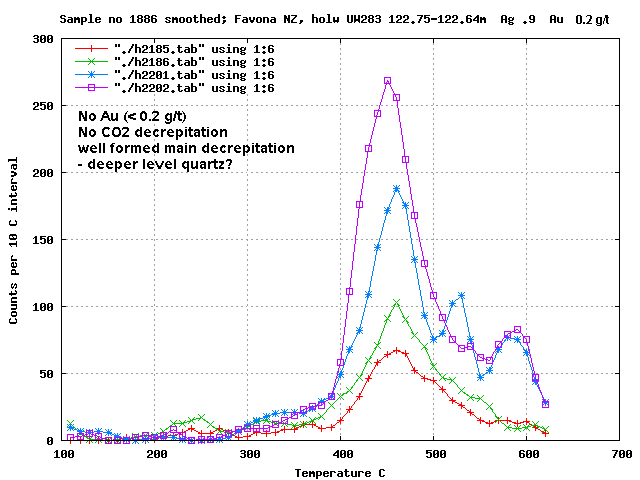 The Favona South shoot (yellow) has less decrepitation and slightly less low temperature gas-rich decrepitation. 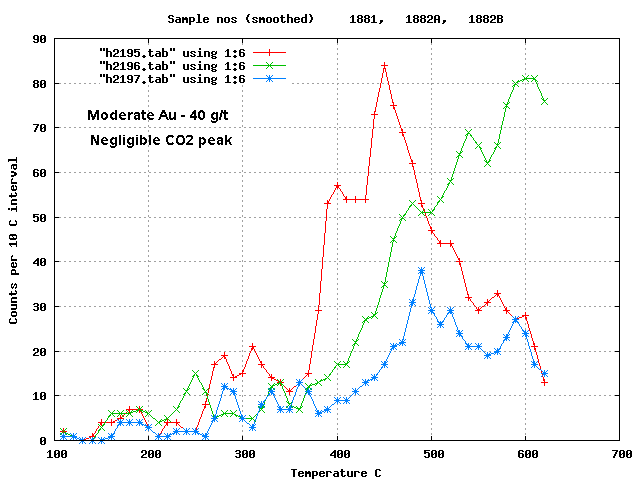 And the Moonlight area (green) has much less low temperature gas-rich decrepitation. 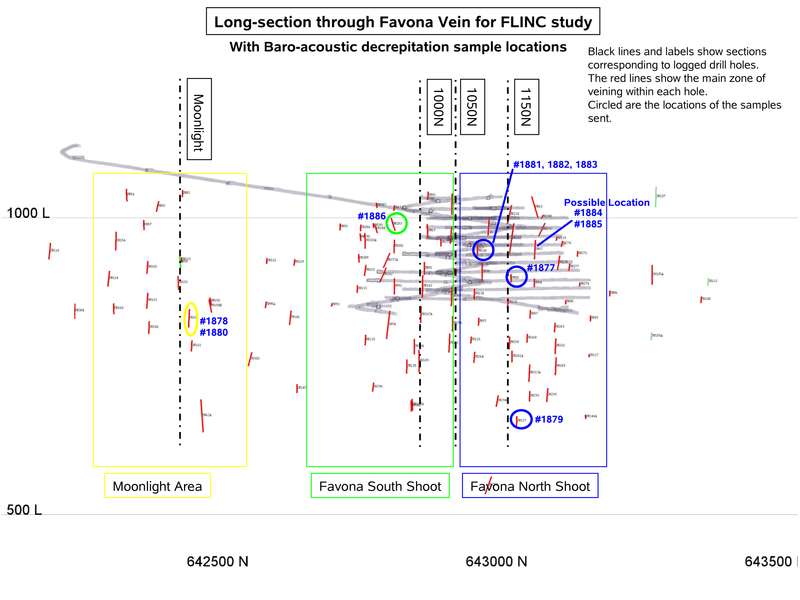 From this it is seen that the best exploration areas are in fact in the shallow areas of the Favona South shoot, which looks more promising that even the deep samples from the Favona main shoot (sample 1879). The data show that the Moonlight area is not a particularly promising exploration target.